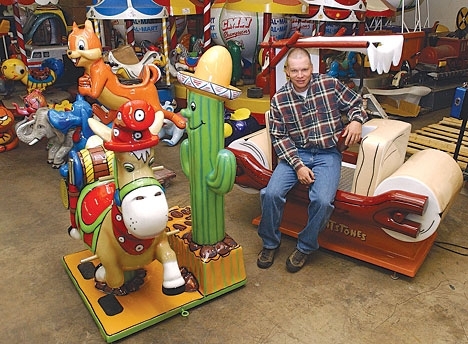 “If it was on Noah’s ark, it was made into a kiddie ride,” says Damon Carson, who refashions old carousel horses, race cars, and other rides. At any given time, Damon Carson owns 10 quarter horses, some of which are missing a leg or two. And he doesn’t mean the Quarter Horse, a breed that excels at sprinting short distances. He means the shiny-coin-worth-25-cents horse. Kiddie Rides USA, a 34-year-old office based in Denver, Colorado, is the last stand-alone kiddie ride company left in America. While the niche market has struggled to withstand the recession, it still sells 50 to 100 refurbished rides per year for thousands of dollars to a diverse customer base, from doctor’s offices to nostalgic grandparents. Carson took over the company seven years ago — “I’ve always liked nostalgic things,” he says — and often relaxes after a hard day’s work by slipping some quarters into an old horse ride. What do you do at work all day? I deal with customers and sales – ordering parts for the rides and buying rides. We receive at least two calls a week from people who have rides for sale; I’ve developed an eye for what’s worth buying. How do you decide which rides to buy? You’re asking me to reveal trade secrets. [Laughs.] It’s about keeping a variety. You don’t want all race cars, or all horses. In the beginning, I just bought the least expensive rides – but pricing is second to buying the right kind of rides. Describe the refurbishing process. It’s much like restoring a car, but with fiberglass. 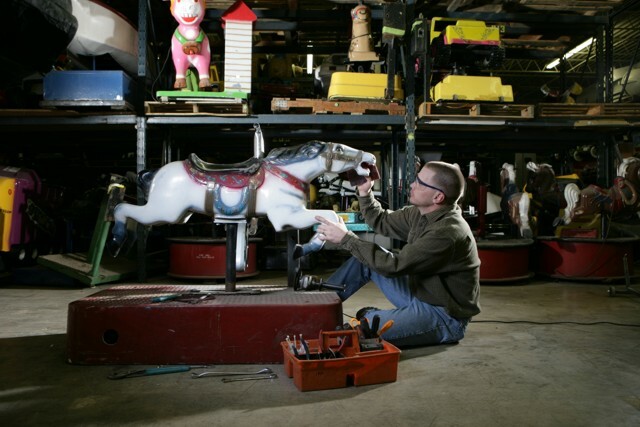 We rewire the electronics and the painter does bodywork – like, if a carousel horse is missing a leg. Then it’s painted and sanded. Carson goes face-to-face with a carousel horse. Are rides ever beyond the point of repair? There’s nothing beyond repair – just maybe beyond economically viable repair. Is your office filled with kiddie rides? According to my wife, it’s “garage sale eclectic.” People love my office. I have a stuffed parrot, a fiberglass ice cream cone, globes and airplanes hanging from the ceiling. I have a few fiberglass pieces for people to sit on, and there is one elephant and one carousel horse in the office building. Most memorable customer: A few years ago, a guy wanted to restore a dolphin kiddie ride for his wife’s birthday – but they didn’t even have kids or grandkids. They were a couple with too much money. I also restored a miniature Corvette ride for a guy in Long Island to go along with his real-sized Corvette. Target audience: There’s not just one. Pediatric doctors make up a certain percentage of our customers, since they buy rides for their lobbies. We also serve restaurants, museums, and the parent/grandparent base. Last spring, we did a carousel for Dr. Phil’s granddaughter, and earlier this year, we did one for the new Walmart headquarters in Arkansas. Do you have kids? Two sons, ages 11 and 12, and a daughter, age 13. I’m assuming they think you have the coolest job ever. They thought it was a lot more interesting when they were younger. The cool wears off. How do you unwind after a long day of work? I drop a couple of quarters and ride a kiddie ride. Which rides are you partial to? The old horse ones. At any given time, I own about 10 quarter horses. Pun intended. How is that a pun? A Quarter Horse is also a breed of horse – but I mean it as 25-cent horses. I like to tell people I spend time with my quarter horses after work. Clearly, I’m not a horse person. That’s okay. Do you vacation to theme parks? No, but I travel pretty extensively, nationally and internationally. Whenever I see a kiddie ride on vacation, I jump on and my wife takes a picture of me. I have photos on kiddie rides in Jerusalem, Israel. Best part of your job: Dealing with customers who buy rides for really fun and interesting reasons. Like the Corvette guy I mentioned (see above). Most challenging part of your job: Trying to profit at the end of the month or year. With the recession, the amount of business has gone down; we refurbish around 50 to 100 rides per year. Amount of time it takes to refurbish a ride: Usually four to six weeks after an order is placed. On average, how much do you charge customers to restore a ride? Around $3,000. Something people would be surprised to learn about the profession: How many shapes and sizes kiddie rides come in. There are hundreds, or even thousands – Ferraris, Porsches, Corvettes, submarines, motorcycles, and every animal you can think of, like ducks, alligators, elephants, cows, and chipmunks. Basically, if it was on Noah’s ark, it was made into a kiddie ride. There’s nothing that keeps more people from becoming entrepreneurs than debt. If you have a fancy lifestyle with big payments looming over you, you won’t be able to quit your day job and take business risks. Instead, save money and live below your means. I spent my first year out of college working seven days a week on the ski slopes at Vail to pay off my student loans. PLUS: For more ride-loving No Joe Schmos, check out the female bull rider, the hot air balloon pilot, and the roller coaster engineer. And another No Joe Schmo who gives new life to old parts: the artificial limb maker. Update: Damon Carson’s new company, Repurposed Materials, focuses on reusing products that don’t need extra manufacturing or processing. The site sells refashioned industrial materials from synthetic turf (priced from $1) to wine barrels (priced from $100) to tire treads (priced from $350). This entry was posted in Cool jobs, Crazy jobs and tagged damon carson, kiddie rides, kiddie rides usa, refurbished kiddie rides by Megan Hess. Bookmark the permalink.